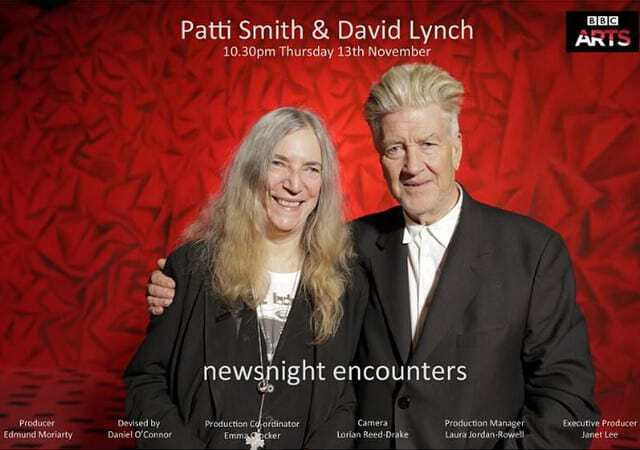 "The discussion was recorded for BBC Newsnight's 'Encounters' series, with topics ranging from the influence of Bobby Vinton's 1963 hit 'Blue Velvet' on Lynch's film of the same name, seeing Jerry Garcia's ghost, liking to ''bite' paintings, as well as 'Twin Peaks', which Smith says 'reconnected [her] to the world and art'." [Patti Smith and David Lynch have a brief conversation at the Fondation Cartier in Paris where they discuss each other's work and their mutual respect for each other. BBC2 Newsnight Encounters, 13 November 2014.